Yes! In just three days you - and the grandparents and parents in your church - will be able to download to your Kindle or computer a free e-Book of my new book - It is Impossible to Spoil Grandchildren! Look what people who have read it are saying about it . . .
“Lynda has given us the gift of a book long overdue! With warmth, wit, and sincerity she shows grandparents it’s more than OK to lavishly love on their grandchildren and shares how to pour into their lives making the positive impact only a grandparent is able to make - the kind which doesn’t spoil a child; rather a love which helps strengthen and shape the heart and character of your grandchildren. 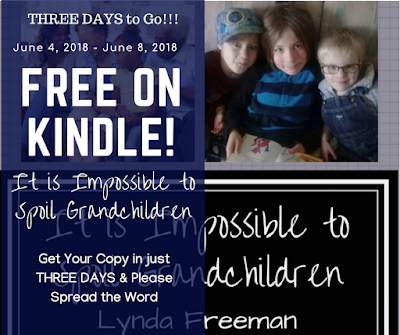 In three days, on June 4, 2018 you will be able to get your own copy - please help spread the word!